Amaranth Grains has been cultivated as a grain for 8,000 years. Amaranth is classified as a pseudo cereal; it is grown for its edible starchy seeds, but it is not in the same family as true cereals such as wheat and rice. Amaranth Granth is the common name for more than 60 different species of amaranthus, which are usually very tall plants having broad green leaves and attractive bright purple, red, or gold flowers. One of the most important aspects of this tiny grain is that it’s gluten-free. When ground, the flour is generally a pale ivory shade, although the red “buds” can be ground as well for a red-tinged and very healthful grain. The amazing thing about amaranth grains is how it compares nutritionally to other grains: far more iron, calcium, protein, manganese, fiber, and other phytonutrients than wheat or rice. 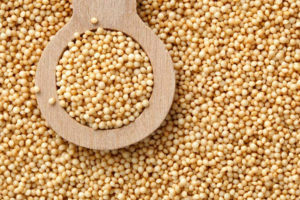 Amaranth Grains is one of the most protein-rich of any plant-based food. We Rajasthan Super Fillers Private Limited, Rajasthan, India providing a premium quality range of Amaranth Grains. We collect Amaranth Grains from their origin, then process them at our plant and then supply to different International destinations for commercial purpose from Udaipur, Rajasthan, India.